More rig control and contesting! 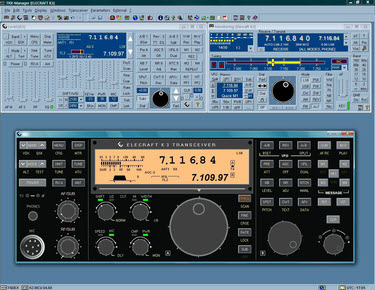 GRAPHIC CONTROL SCREENS FOR ELECRAFT K3 & KX3 TRANSCEIVERS! TRX-Manager 5 includes important improvements for Elecraft K3 and KX3 transceivers. KX3 is now fully supported and both K3 and KX3 have specific graphic control screens similar to their real front panels. (see External/Elecraft FP Submenu in TRX-Manager V). A new menu window is also available, making any changes to the K3/KX3's settings, and editing of complex macro (including menu) commands, easier. TRX-Manager 5 K3 virtual front panel. rig control screen. TRX Manager now tracks IOTA awards progress! Plus full information about each IOTA Island is available for IOTA spots (<right click> + link with Google). Additional spot info with google link. At last, TRX-Manager's Logbook includes a CONTEST MODE! 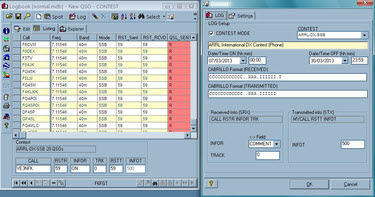 The Logbook can be configured for almost all contests by defining the Cabrillo format for that contest. 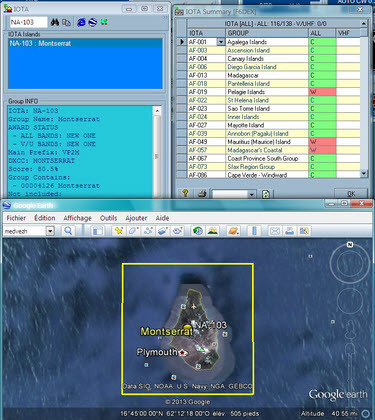 Export is supported using the Cabrillo format. CW macros now include the serial number. Some of the most popular Contests are pre-defined, with more to be added soon. Please note that real-time statistics are NOT supported. TRX-Manager version 5 integrates seamlessly with LOGic 9. DISTRIBUTION: This new version is now distributed as an electronic product, saving shipping costs and delays. (To make a hard copy, simply copy the file onto a CD.) It is fully compatible with Windows 8 32/64bits and does not require specific UAC settings for installation and registration. There are under-the-hood changes that, while not visible, are a solid platform for future enhancements. PRICING: TRX-Manager 5 is $75 for new users. The TRX-Manager 5 upgrade is NOT a free update. It requires a new installation. If you are a registered user of any previous version of TRX-Manager or FT-Manager, you are eligible for the special upgrade price of $55. TRX Manager 5 includes THREE years of free, downloadable, updates, beginning with date of purchase. The purchase date is based on the day your order is processed. When that 36-month period is up, you may purchase another three-year period of downloadable updates. Whatever the date of your purchase and the version you are running, you are eligible for free email support as long as TRX-Manager is commercially distributed. ORDERING: CLICK HERE to place an order. Be sure to include your callsign when ordering. If you are an SWLer, please state this in the Comment section of the order form. Please note that TRX-Manager V5 is a DOWNLOAD ONLY product. After your order is processed you will receive an email with a link to your customized download. SYSTEM REQUIREMENTS: 32 bit or 64 bit Windows. Warning: not compatible with DBCS versions of Windows (China, Japan, Taiwan, Korea). Even English-enabled Japanese will not work. When in doubt, try the demo! FINALLY: In case you have not already clicked on one of the previous links, here it is again. DOWNLOAD THE TRX-MANAGER DEMO. To keep everyone happy, please read our Return Policy before purchasing this great product. features vary from model to model. Download the demo to test your radio's capabilities.